John "Steamboat" Fulton: What can I say about this event? It was monumental in size, scope, and historical significance. There were so many Civil War reenactors in attendance that for a day Charleston took on a flavor of 1864. Troops staging at the Battery area seemed to form an endless mass that totally consumed that area of the city. Troops were interspersed with widows dressed in period black dresses, vails and parasols. 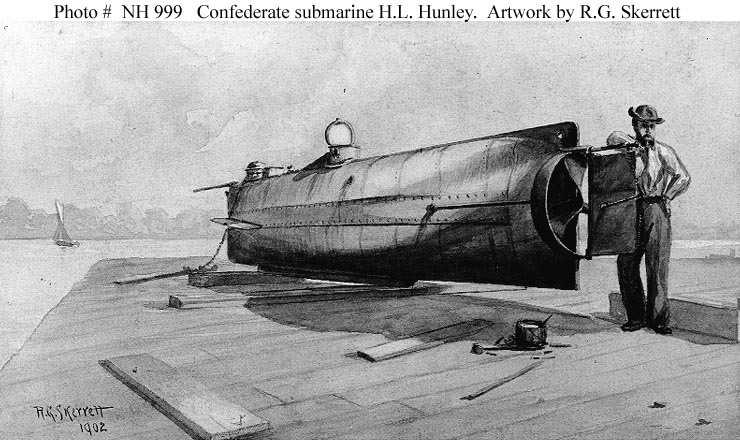 It took 2 hours to assemble everyone in place and to transfer the caskets of the Hunley crewmen from hurses to the horse-drawn limbers by Subvets. This was accomplished well out of site of where Blue and I were staging, and was my only real dissapointment, since that moment would have been very meaningful for me personally, blending my two great passions: Civil War reenacting and Submarine history. When we finally stepped off on the long march through town we were very fresh and exilerated, proud to be a part of this historical event. We were positioned in about the middle of a procession of troops that must hace streached literally for miles. There were THOUSANDS of spectators lining both sides of the streets for the entire route. My most rewarding and proud moments were seeing all of the dolphins pinned on the chests of those among the spectators. Ladies and Gentlemen,I am not exagerating when I say that I have not seen as many qualified Submariners since I left the Navy 40 years ago! Whenever I could catch the eye of a Brother of the 'Phin I would give a nod or a discrete hand signal. Or on the occassion that I could break ranks on a halt for a few moments and holler out those familiar words "What Boats?" a friendly greeting followed. I can testify that our Brothers of the 'Phin did themselves proud by showing up in great numbers for this solomn occasion. And for the first time in 40 years I had civilians and other reenactors recognize my dolphins proudly displayed on my uniform and they KNEW WHAT THEY MEAN!! The march took over 3 hours with innumerable halts and starts. Blue and I were starting to feel the fatigue during the last mile. But upon entering Magnolia Cemetery everything went into slow motion, with numerous orders to halt, stack arms, rest in place, then another order to march, for about 100 feet and another halt. Finally we were all in place behind the elevated stage where the caskets were lined up. The funeral ceremony was very solumn and poinent including Catholic, Protestant and Masonic rites. Confederate Navy and Army reenactors carried the caskets from the stage to the gravesite in a very dignified military style. We finally marched off to pass in review of the gravesites, but when it became obvious to me that this movement was going to take over another hour, and these 61 year old legs had been supporting this famished and out of shape body for over 10 hours with no real rest, I had to reluctantly pack it in and leave the formation. Blue, though he had terrible pain from some bad foot blisters, dropped out to support me. He really wanted to tough it out to the end, but I felt that my body could stand no more (as it was we had over another mile hike to my truck). As I sit here at home at my computer reflecting on the previous days events, my feeling is of great pride... pride that so very many thousands of people including reenactors and spectators turned out to pay their respects to these early submariners. And pride to wear my dolphins in an atmosphere of patriotism, recognition and appreciation. In an era when we think that the politically correct groups have taken over our thought process, it is extremely rewarding and enlightening to witness such an outporing of respect and patriotism. And my pride was increased exponentally by marching next to a tall, lanky red haired guy wearing a Confederate uniform decorated with a beautiful set of gold Royal Austrailan Navy Dolphins! Thank you Blue... you are a true (ship)mate! As Blue would say "At the end of the day" we both have a permenant entry engraved in the hard drive of our memories. Steamboat sends. Bob Moore: Along with 6 other subvets, I was a pallbearer for Boatswain's Mate James A. Wicks. We were on The Battery before sunrise, and the crowd was already swelling. There may well have been more Cofederate troops in town than there were in 1864. Shortly after sunrise the line of hearses approached and the chatter of the crowd quieted somewhat. Twenty five minutes or so later all eight of the coffins had been ceremoniously placed on the biers, and the work of the Subvets was done. It wasn't like burying a friend (I have done that too often) but it was still very intense. I had in my right hand the remains of a fellow sailor whose qual number was a single digit. It takes cojones to ride any kind of submarine, but if you have seen the H.L. Hunley you have to wonder how they got the wheelbarrows on board. No kidding. Those men most definitely had what it took. Ask yourself if you would have even walked aboard a boat that had already killed two crews, much less hand cranked it into combat. They were, so to speak, my ancestors, and I am so proud of them. Their final resting place is in Magnolia Cemetery, next to their mates from the first two crews. That is as it should be. Ralph Luther: This was a most moving experience for me. To be able to witness the dedication of the Civil War Reenactors from all over the Eastern Seaboard to come here to do closure to these 8 seamen will be remembered for a lifetime. There were 50,000+ people attending. The weather was beautiful for the occasion and once again Blue has shuck off the hex that has been following him on his tour. Blue's taking part in this funeral is heart felt also. He is truely a Brother of the Phin. Ed Walker: We like to brag about Charleston's weather, but the day of the funeral was absolutely perfect: warm with a great breeze. That made the flags in the procession really wave. Blue and John were involved in the main event, however, they missed a week full of special events throughout the Charleston area. Reenactors were camped in many different locations including Fort Moultrie, right opposite Fort Sumter, where the smell of campfires lingered through Sunday. There were many Civil War bands involved in the procession, some playing authentic period music and instruments. I got to hear two of them. Blue probably didn't have as much of a feeling as some of us when they played Dixie. At the beginning of the week the caskets were carried to the USS Yorktown where they lay in state for two days. Then they went to local churches. The sounds of the rifle and field pieces as they went off during the funeral salute were pretty impressive. Even more impressive were the deliberation and discipline shown by those renactors who actually were involved in the transport and committal of the caskets. The precision of their movement, especially the slow hand salutes, equaled or bettered other military funerals I have seen. Earlier in the week when various artillery units were firing salutes a "target/skimmer" sailor said that they were louder than any five inch/38 he had ever heard. The President of the Hunley Commission gave a good eulogy which emphasized both the bravery of the Hunley crew and their historical significance, but above all emphasized the fact that this last Confederate burial was a religious event..Sunday there was a steady stream of folks who hadn't gotten to Magnolia Cemetary who passed by the still open grave throwing in more flowers and dirt. One of the groups was a contingent of bikers, here for the Heritage Motorcycle Rally, many of whom had Confederate flags on their jackets.